Outer space is seen by many as a new arena for human endeavour, a place for a fresh start for humanity. Others who are less hopeful have looked to space for its military potential, and indeed the first human-made vehicles to fly through space were military in origin. 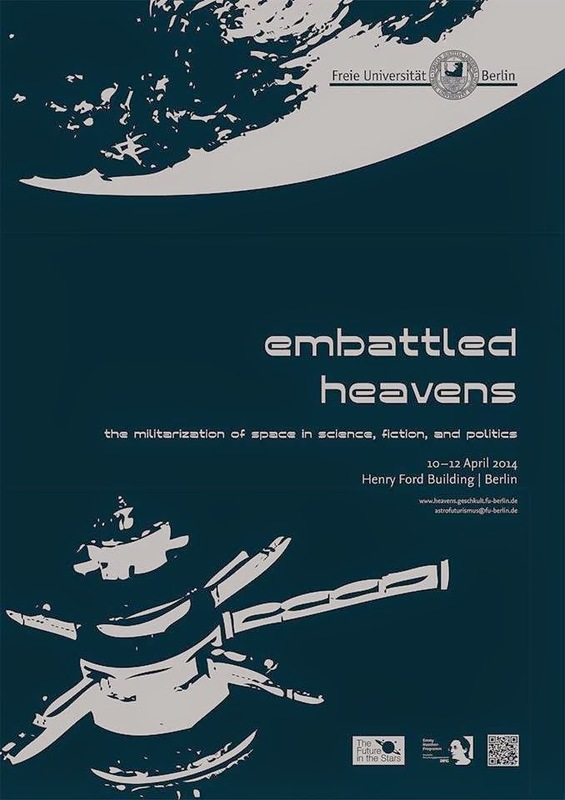 This duality has not often been explored head on by academics, but such a discussion was opened April 10 to 12 at a conference at the Freie Universität in Berlin entitled Embattled Heavens: the militarization of space in science, fiction and politics. My own historical research has focused on the intersection between military weapons and space exploration. So I was pleased to go to Berlin and take part in this discussion of what its organizers called "the military dimensions of astroculture in the period from 1942 to 1990," the period starting with the launch of the first human-made object beyond Earth's atmosphere, a German V-2 ballistic missile, and ending with the conclusion of the Cold War that drove the early exploration of space. Here I will feature some of the many insights raised at this conference that caught my attention. There were many other ideas that I don't have room to discuss here, and I will explain my own presentation in a future blog entry. The first day's keynote presentation was delivered by Alex Roland, an American historian who has gone from the NASA History Office to become one of the foremost critics of America's thrust into space. He noted that the 1960s space race that culminated in the first human steps on the Moon was a competition for prestige that substituted in some respects for an arms race during the Cold War. Roland compared the space race between the United States and the Soviet Union to a Potlatch featuring conspicuous consumption of property to showcase the power and prestige of its superpower participants. The militarization of space during the Cold War was itself cold and passive in that spacecraft were launched that supported military operations, including weather, reconnaissance and global positioning satellites, he said. But at the same time no shots have ever been fired in anger in space during the nearly seventy years of the 'long peace' between the superpowers that included the Cold War and the quarter century since it came to an end. Smithsonian Institution historian Michael Neufeld noted the contrast between the reality of routinized military operations in space and the chaotic nature of space wars depicted in the science fiction that helped inspire space exploration. German political scientist Bernd Greiner explained that the Cold War shaped the first steps into space in many ways, notably the Cold War's emphasis on permanent military preparedness that encouraged the routine nature of military operations in space. The space race was fostered in part by the Cold War's emphasis on fighting for the hearts and minds of civilian populations. The conference took place in Europe, which was not involved in the early superpower space race but joined the ranks of space powers during the latter years of the Cold War. In contrast to the superpower competition in space, Europe's role in space has featured cooperation between states in the European Space Agency and earlier efforts to develop a European space launch vehicle, according to Michael Sheehan, a professor of international relations at Swansea in Wales. Sheehan explored a major conference theme - the influence of science fiction on space exploration and military operations - with his statement that the boundary between government policy and science fiction as it affects space exploration is not clearly delineated. The influence of science fiction has been apparent in many U.S. military documents, he said, notably those related to the so-called Revolution in Military Affairs of the 1990s. Social unease related to the Cold War, on the other hand, permeated U.S. science fiction movies in the 1950s, he added. In spite of differences between Europe and the United States, for instance in the more dystopic flavour of European science fiction, the differences between Europe and America are not as great as is sometimes believed. Europe's space program, for example, has taken an increasingly military orientation over the years, similar to the American emphasis on military space, Sheehan said. One area where Europe has followed the United States is in navigation satellites, where Europe's Galileo satellite network is following the U.S. Global Positioning System. Smithsonian historian Paul Ceruzzi explained how European concerns arising from American control of GPS during the 1998-99 conflict in Kosovo caused European officials to create their own navigation system in spite of its great expense. Today military-operated navigation systems have become an integral part of civilian infrastructure and economies. Several presenters raised new research tying space research to military origins, including Jordan Bimm of York University in Toronto, who told how the "Mars Jar" simulations of the martian atmosphere originated with U.S. military experts rather than astrobiological researchers, and Isabell Schrickel's work relating space mirror proposals to science fiction, military applications, energy needs, and possible use to combat climate change. Many other ideas and perspectives, including controversies over unidentified flying objects, and literary criticism of space efforts, were offered as part of Embattled Heavens, although one participant criticized the lack of feminist perspectives at the conference. The history of space exploration is being looked at in new and more critical ways. Embattled Heavens has broken new ground in this new critical examination of humanity's first push beyond Earth's atmosphere. Early historical accounts of the Cold War space race emphasized interest in exploration for its own sake, an idea that has come under increasing question in recent years. I came away from Embattled Heavens with the belief that the military role in the early history of space exploration is greater than is generally acknowledged, for better or for worse. Space Launch Canada graphic of possible launch trajectories from Vancouver Island. To date, no satellite has ever been launched from Canadian territory, but for the past few years a group headed by a Vancouver astrophysicist has been trying to change that by promoting the idea of launching satellites from Vancouver Island. Redouane Al Fakir, the driving force behind Space Launch Canada, first announced his idea in 2010, and he has been seeking financial and other support since then. In March, he told the Alberni Valley News that Space Launch Canada has reached an agreement with the University of Victoria Centre for Aerospace Research to launch three satellites. It turns out that the negotiations are still going on. We will have to wait to see whether Dr. Fakir can succeed in getting a payloads and the finances he needs to change his hopes into realities. There are still many questions surrounding his scheme, including what kind of rocket will be used, and where it would come from. Dr. Fakir told the Alberni Valley Times that the first satellite will be launched from a site outside Canada, but he hopes to launch the second and third satellites from unspecified locations on Vancouver Island. In all likelihood, the rocket will be produced in another country. 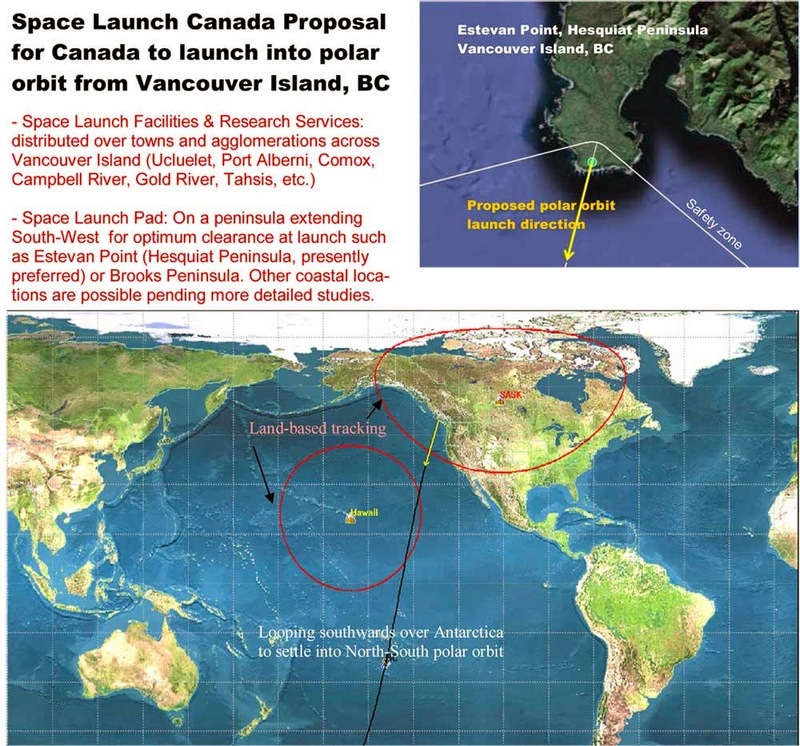 In the past, Space Launch Canada has proposed launching from a headland on the west coast of Vancouver Island such as Estevan Point, just west of Strathcona Park. A rocket heading in a southerly direction from there would have thousands of miles of ocean to fly over en route to a polar orbit, much like satellites launched from Vandenberg Air Force Base in California. If this proposal comes to fruition, it would mean a major change of direction for Canadian space efforts, because no satellite has ever been launched from Canadian soil, or on a Canadian rocket. Canada does have a history in rocketry with the Black Brant series of sounding rockets that are still being made in Winnipeg, and the rocket range in Churchill, Manitoba, that operated from the 1950s to the 1980s, sending scientific payloads to the edge of space for a brief time before they fell back to Earth. More recently, various private initiatives have arisen to promote Canadian launchers and Canadian launch sites. But up to now, none of these initiatives have met with success. In 1967, a Canadian government report on space exploration written by a committee headed by John H. Chapman recommended that Canada purchase launch services for our satellites from other countries, but consider building a launcher for small scientific satellites. Since then, Canadian satellites have all flown on foreign-built rockets launched from sites in the United States, Kazakhstan, French Guiana, and India. There is no suggestion that the Canadian government has developed any interest in building Canadian launch vehicles or Canadian launch pads. The space launch business has been very expensive, competitive, and prone to booms and busts. Canada is not a prime launching location because many satellites, notably communications satellites, are best launched near the equator to get into geostationary orbits. For satellites going into polar orbits, launch sites such as Vancouver Island offer good possibilities. As mentioned, the U.S. Air Force launches spacecraft into polar orbits from a launch site at Vandenberg Air Force Base on a south-facing portion of the Pacific Coast between San Francisco and Los Angeles. Cape Canaveral on the Atlantic Coast in Florida is used to launch spacecraft into orbits closer to the Equator. And while Space Launch Canada's proposal is a first for Canada's Pacific Coast, the U.S. military did consider establishing a launch site nearby in Washington state. While researching at the National Archives in Washington, D.C., a few years ago, I came across some air force documents from 1946 suggesting that a "Guided Missiles Test Facility" be established about half way between Cape Flattery at the opening of Juan de Fuca Strait, and Aberdeen on the west coast of the Olympic Peninsula. Satellites were still more than ten years in the future, so there was no talk of launching satellites in those documents, but various flight paths for missiles, including routes along the B.C. coast, were considered. It appears that the proposal met a quick death due to tight budgets in the late 1940s and the superior attributes of the launch site at today's Vandenberg Air Force Base. Because the Washington State launch site would have faced west with limited southern exposure, its location would restrict options for launching satellites, a problem the proposed Space Launch Canada launch site doesn't have. Despite the possibilities offered by a Vancouver Island launch site, there are already many established launch sites around the world today. So it remains to be seen whether Space Launch Canada's proposal will make economic sense to potential investors and customers.